While walking back to my car, saw this Redding Egret fishing near the shoreline. Almost kept walking as I was worn out from an active early morning shoot but decided to lay down one more time. Glad that I did as he cooperated with some good feeding shots. One way to get action shots with shorebirds is to start shooting a burst of shots when their head starts moving down towards the water. Was able to capture a nice see-through splash as his head dove into the water. The high shutter speed froze the action when the splash was at its peak. With the light being harsh around 9:00 a.m., the colors were very muted so decided to use B&W on this one. 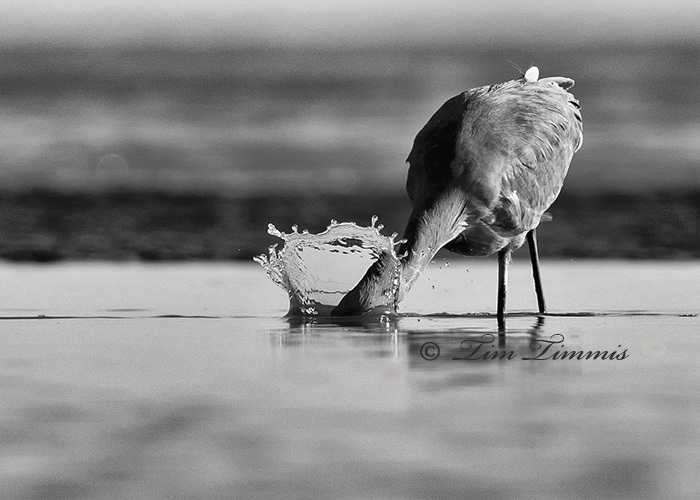 This entry was posted on February 1, 2015 by Tim Timmis. It was filed under Birds and was tagged with Bolivar Flats, Canon 1.4x III, Canon 1DX, Canon 500mm F4 IS II, Reddish Egret, Skimmer ground pod, Splash, Wimberley II. Sweet water action. I guess you have been tearing it up every weekend on the Avocets at Bolivar? Thanks Doug. Haven’t been there every weekend but several. It’s prime time at Bolivar with low tide at sunrise in the winter. Have to take advantage of it while I can. Nice! Love the splash. Amazing how wrong the weather forecast for today was…went yesterday. Thanks Matt. Took this shot the day that we met out there right before we got to the parking area. I skipped this weekend. Tried to catch up on my sleep for once. 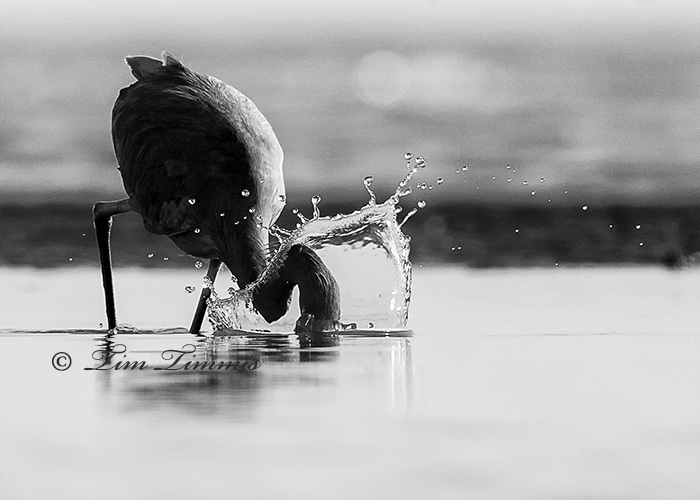 I like how you captured the motion of the bird and the splash. I also like how water looks like a crown around bird’s head. Thanks Cornel. It’s always good when the splash is that large. B&W works, hitting your mark! Thanks David. I don’t use B&W very often but sometime it works well. I need to try it more.